Whether you're deciding what to takeaway for lunch or planning a meal for your family, we've made it easier for busy women like you to make a healthy choice. 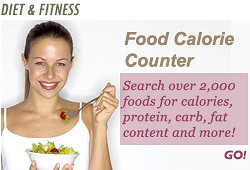 Search over 2,000 foods for calories, protein, carb, fat, cholesterol and fiber content - right here! Keywords should be at least 3 characters in length, e.g. "milk". If no results are found, try searching for the individual ingredients instead, e.g. "ham" and "bread".